Stella Collins in Hollywood Walk of Fame. 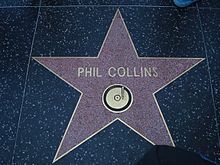 Philippus David Carolus Collins (Anglice Philip David Charles "Phil" Collins), natus die 30 Ianuarii 1951 Londonii, est cantor, tympanista, scriba carminalis, productor musicus et actor Anglicus. Membrum Ordinis Victoriani Regalis etiam est. Collins notus est ut cantor in suo curriculo proprio et ambo ut tympanista et cantor gregis musici Genesis. Carmina notissima sua sunt e.g. In the Air Tonight, You Can't Hurry Love et Another Day in Paradise. Vicimedia Communia plura habent quae ad Philippum Collins spectant. Novissima mutatio die 2 Iulii 2016 hora 01:34 facta.